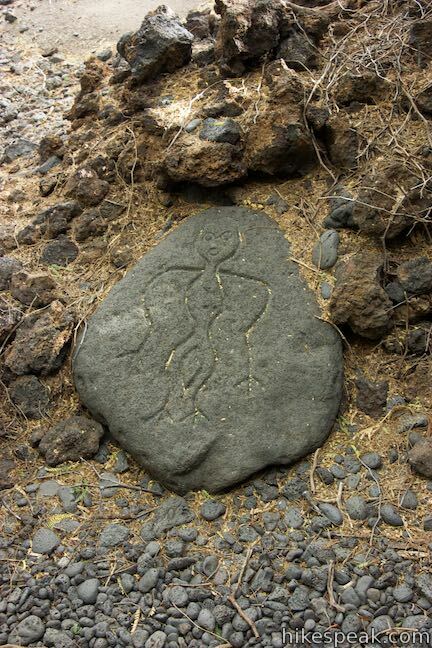 Puakō Petroglyph Archeological District (also know as Puakō Petroglyph Park) is located on the west side of the Big Island, about 25 miles north of Kona. 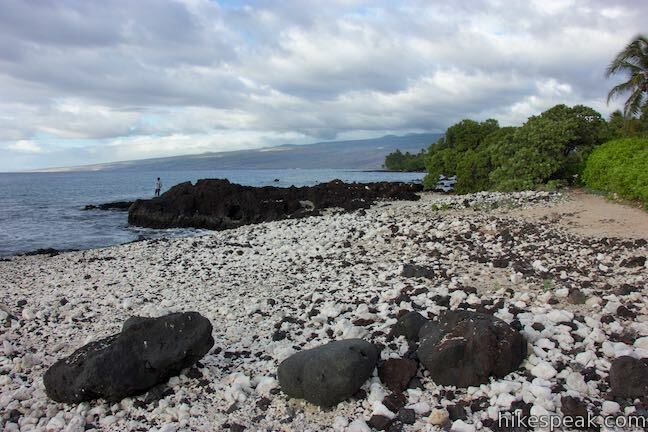 Start from a parking area at the end of Holoholokai Beach Park. 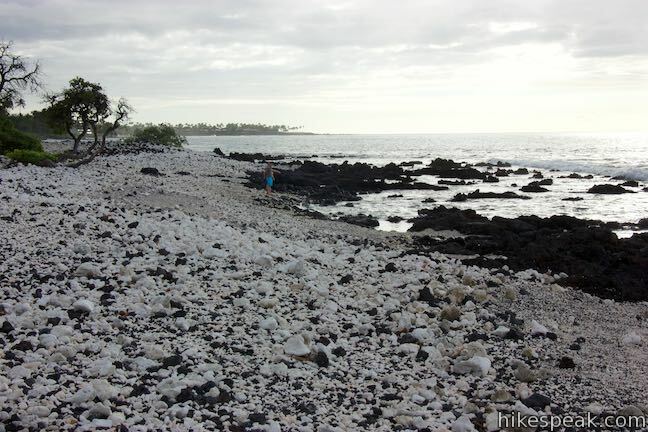 Find Malama Trail heading inland, instead of (or in addition to) heading west to the beautiful black-and-white Holoholokai Beach covered with black lava and white coral. 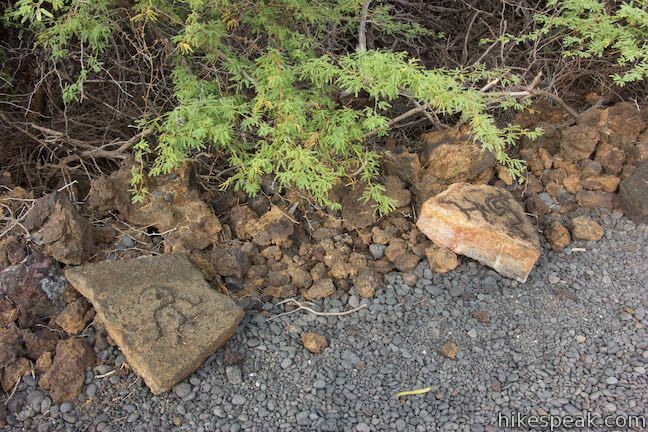 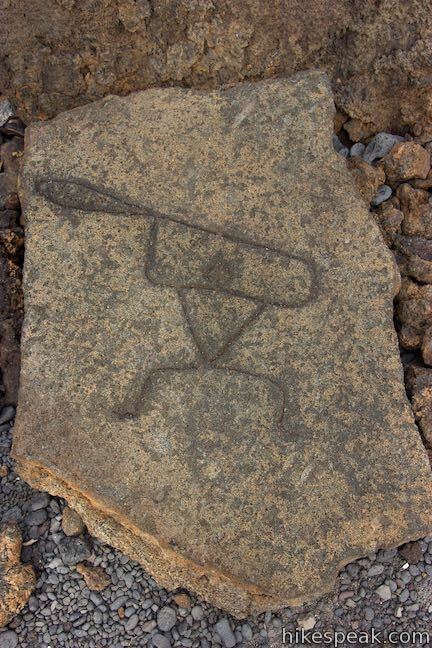 The Puako Petroglyph site is one of the largest and finest concentrations of the mysterious symbols left in Hawai‘i. 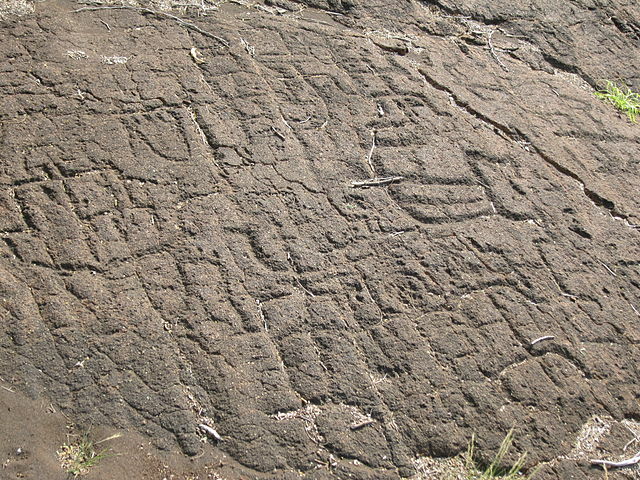 It is likely that many of these petroglyphs were made sometime between AD 1000 – 1800. 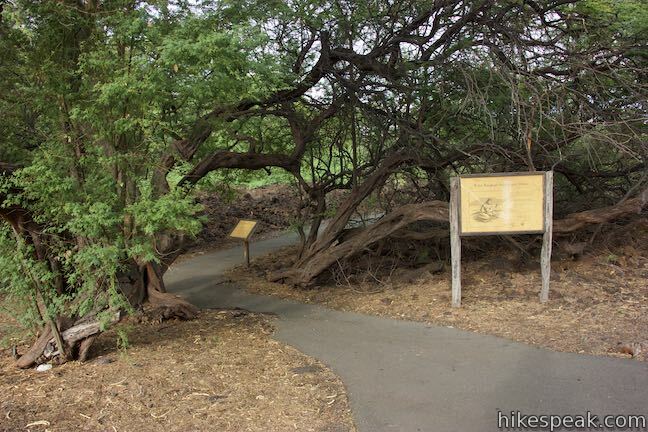 Take the paved trail on a short snaking path to the edge of a forest of kiawe trees. 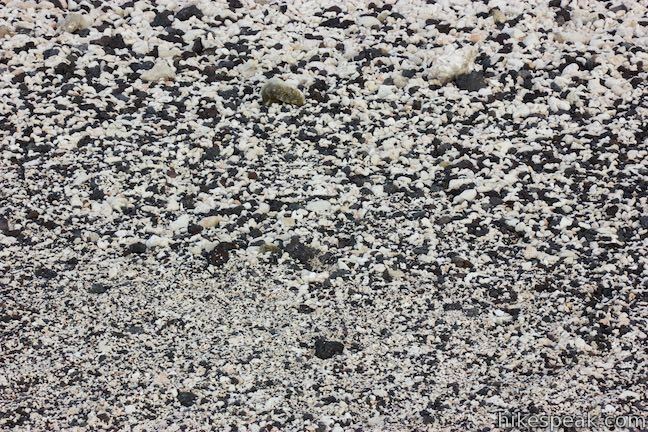 When the pavement ends, it’s time to have a look around. 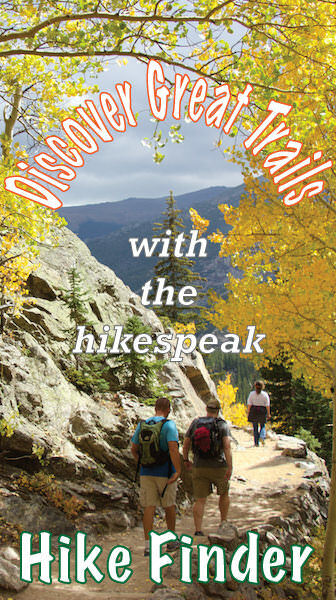 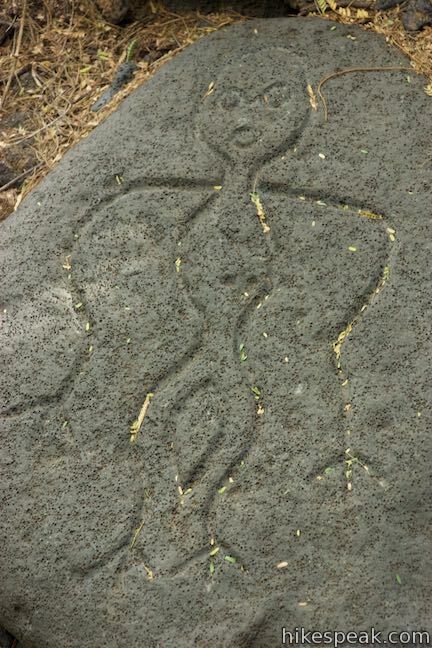 On the right and left sides of the trail, discover gravel areas wrapped by dozens of rock carvings. 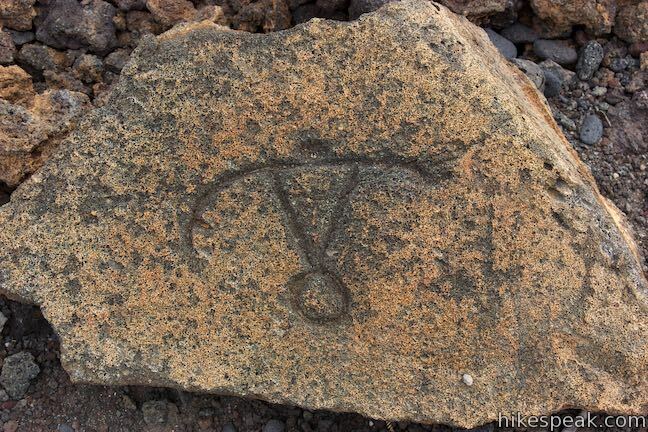 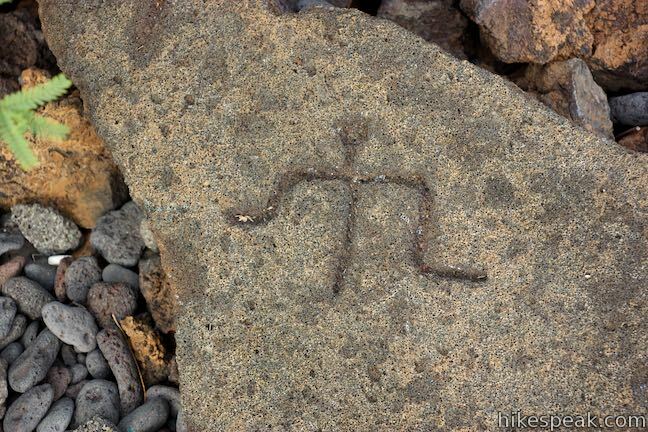 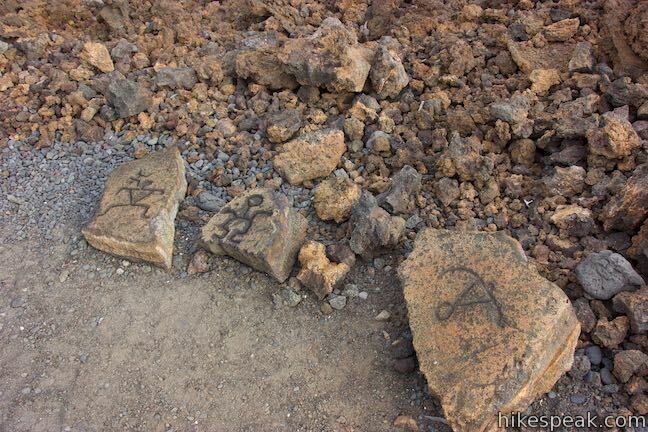 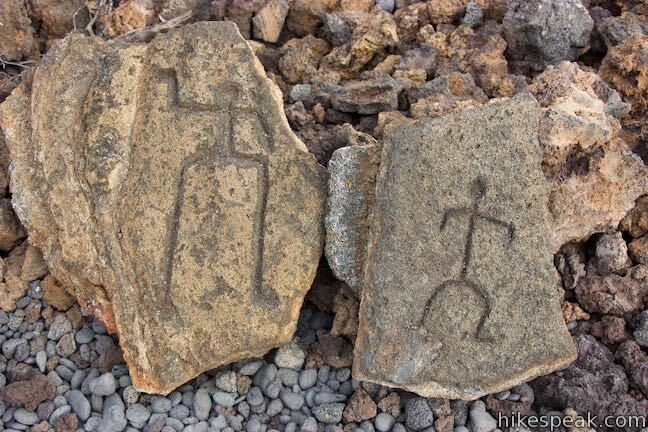 If these petroglyphs appear to be perfectly displayed for hikers, that’s because… they’re on display for hikers! 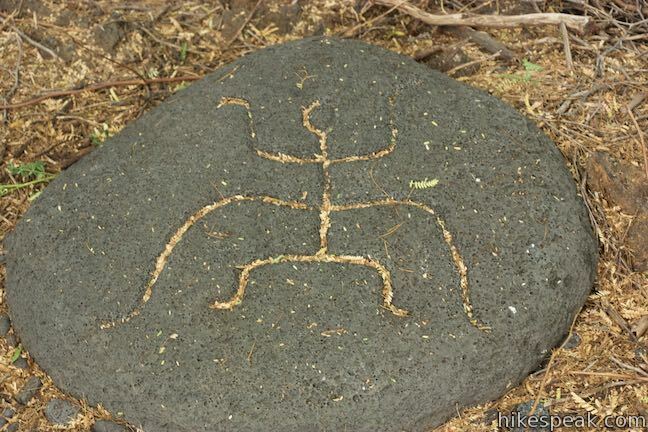 These carvings are actually replicas of some of the area’s true petroglyphs. 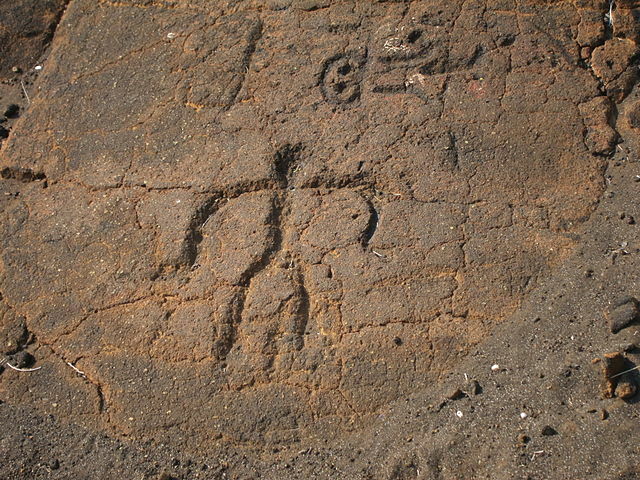 The reproductions visitors to look closely at different figures carved into lava rocks. 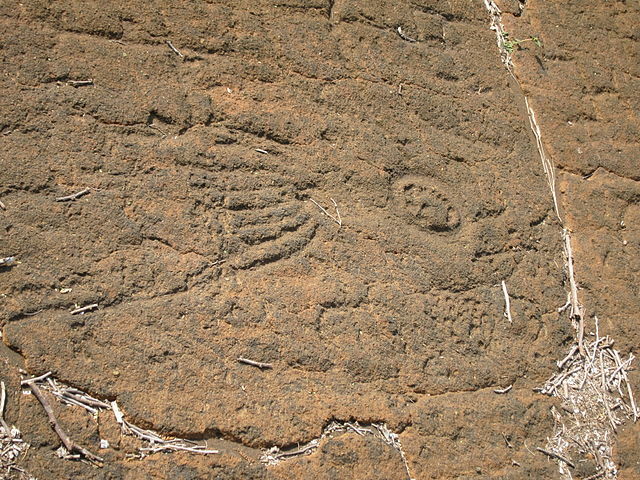 Investigate each carving and interpret the stories that they might tell. 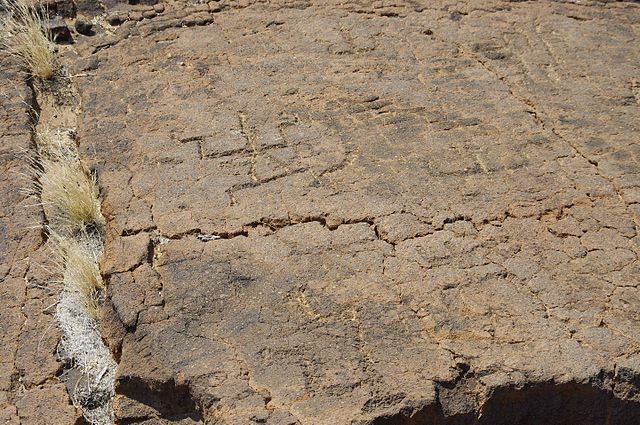 While it is illegal to touch or make rubbings of the historical petroglyphs in the area farther up the trail, these reproductions do not have the same level of protection. 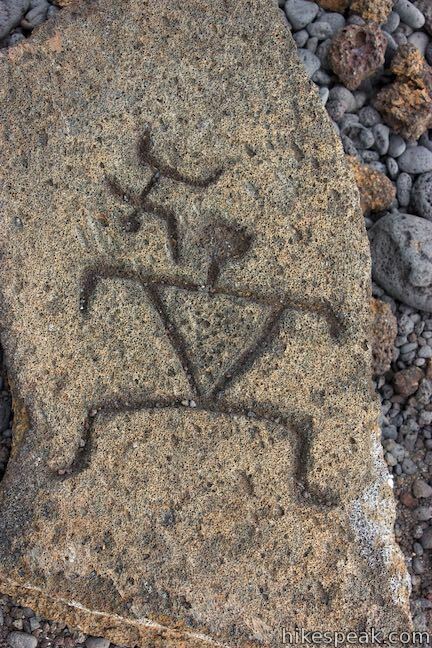 The petroglyph reproductions are open for hands-on examination (that young hikers in particular may enjoy). 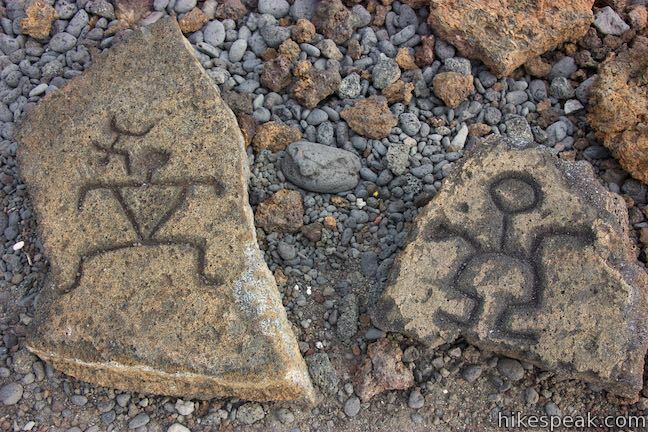 Even through they are replicas, this area of reproduced petroglyphs is quite interesting. 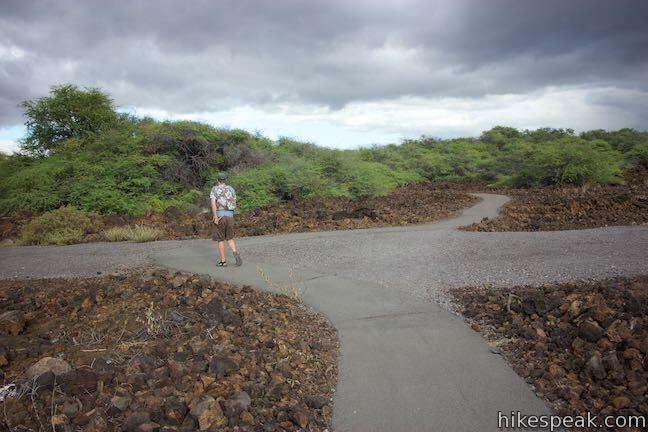 For those who turn around when the pavement ends, the result is a 0.2-mile round trip walk with just a few feet of elevation change. 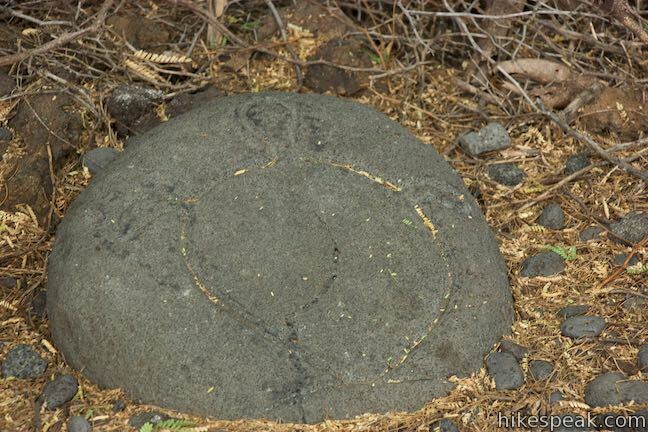 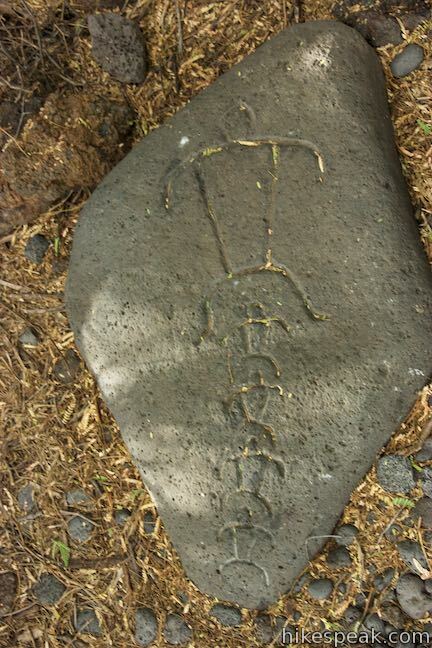 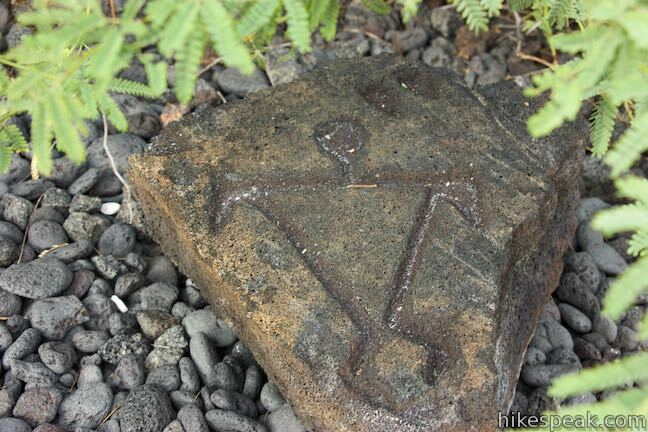 The real petroglyphs are located another half mile up Malama Trail. 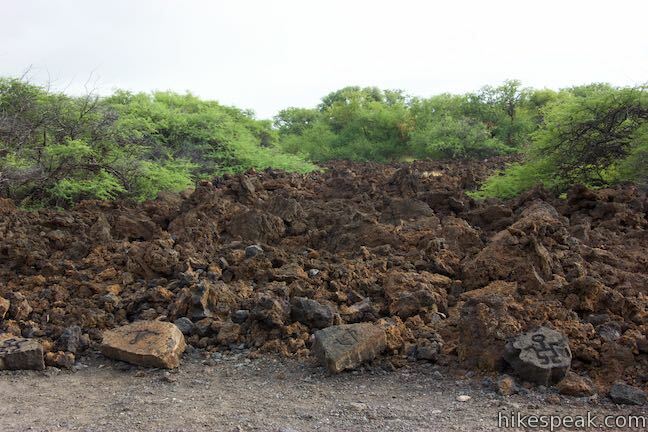 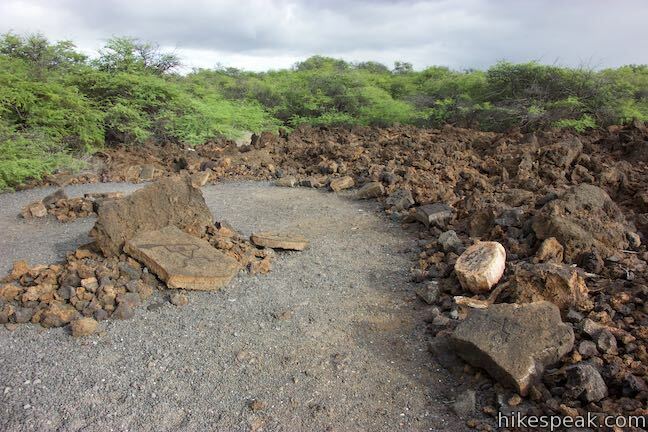 Don’t attempt the next section of the trail with flip-flops or other inadequate footwear because the kiawe trees are thorny and the lava rock underfoot is uneven. 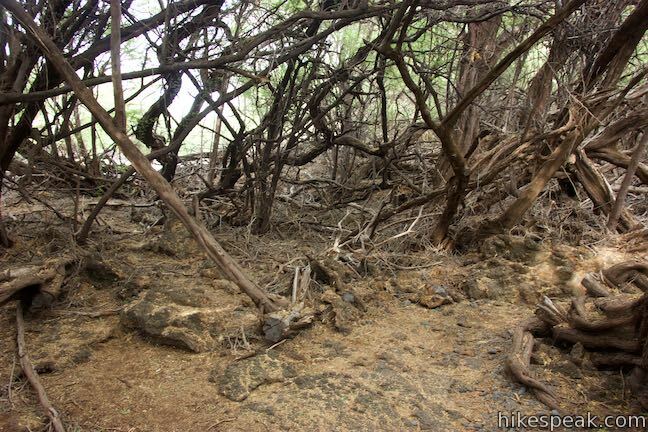 Beyond the pavement, the trail is engulfed by trees. 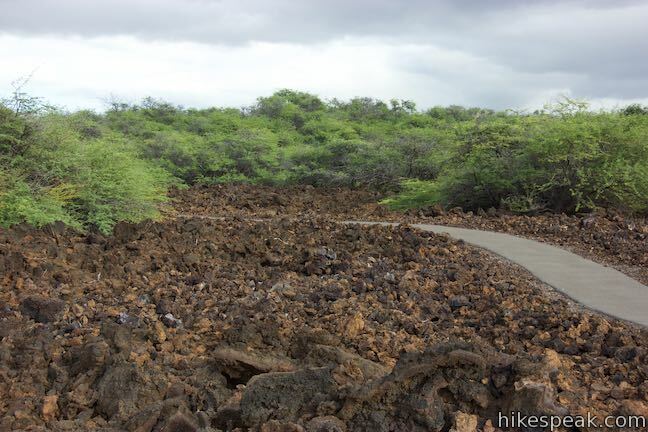 Make your way through the kiawe forest and across a plane of pahoehoe lava. 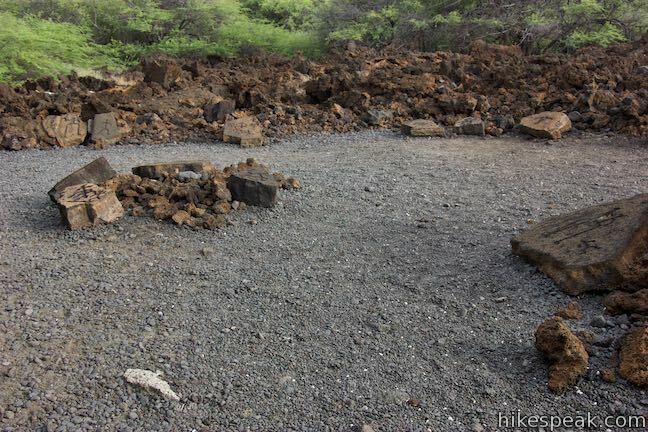 You will pass a lava cave along the way. 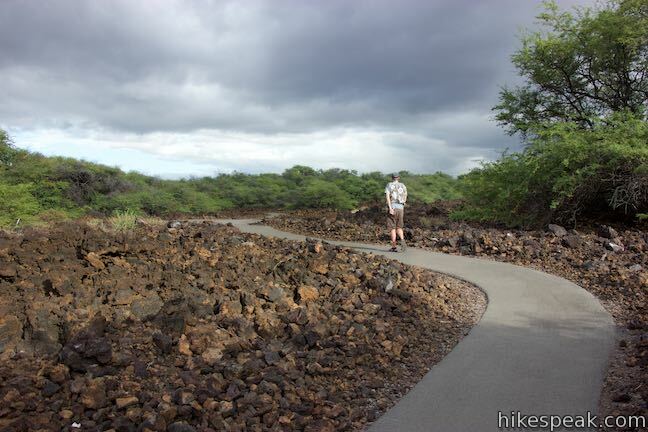 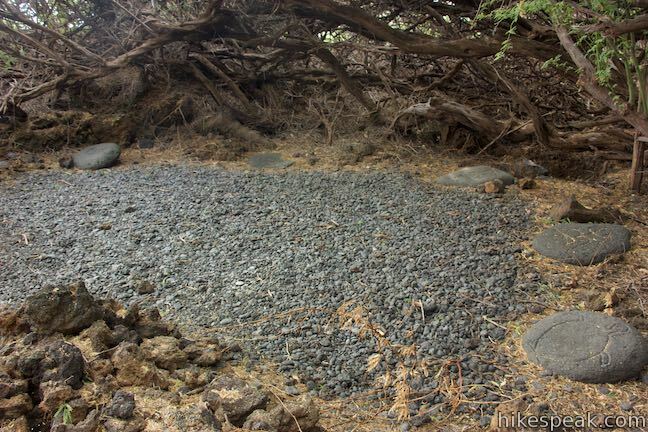 Malama Trail is marked with cairns or “ahus” rock mounds. 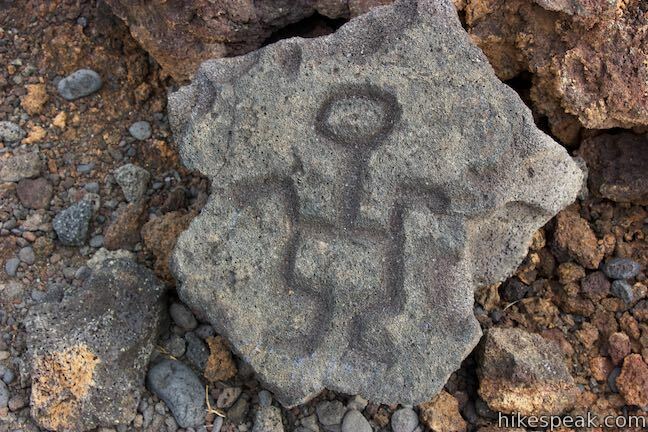 After the trail exits the forest, hike straight through an intersection with a dirt road, one hundred yards before the petroglyph field. 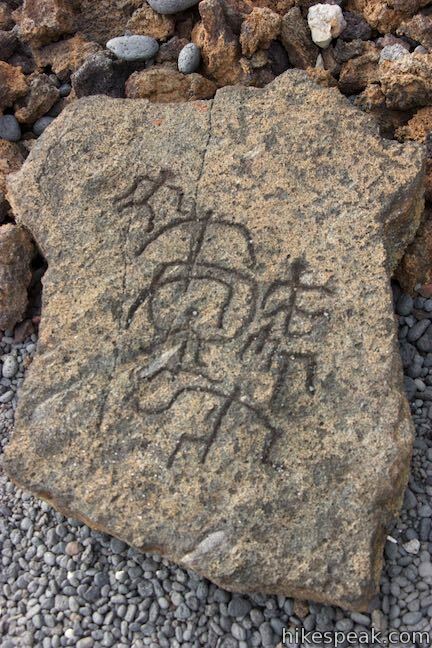 Puakō Petroglyph Field is fenced off for preservation, so circle the railing and examine the authentic rock carvings. 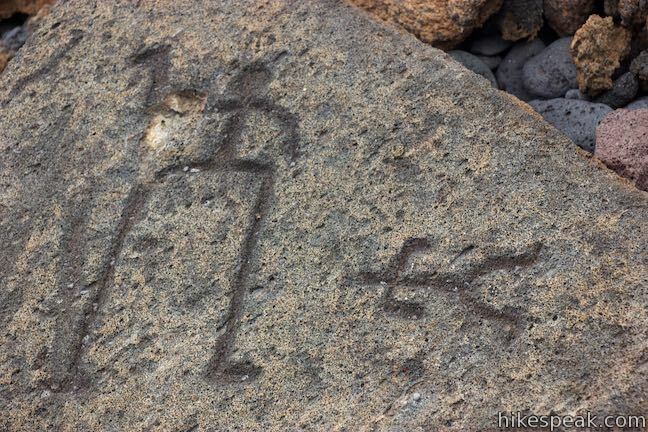 Spot petroglyphs resembling paddlers, dancers, hunters, anglers, and animals. 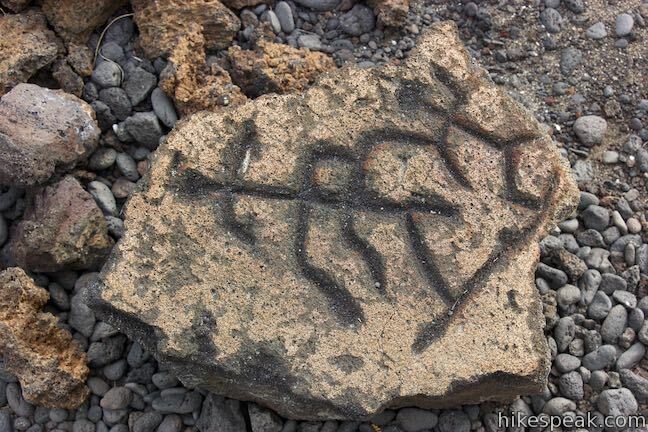 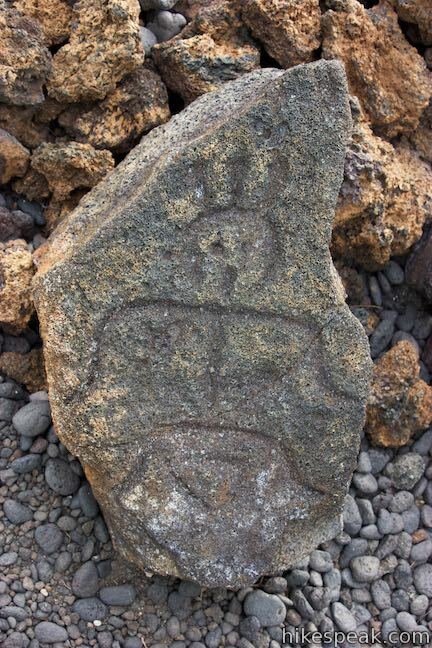 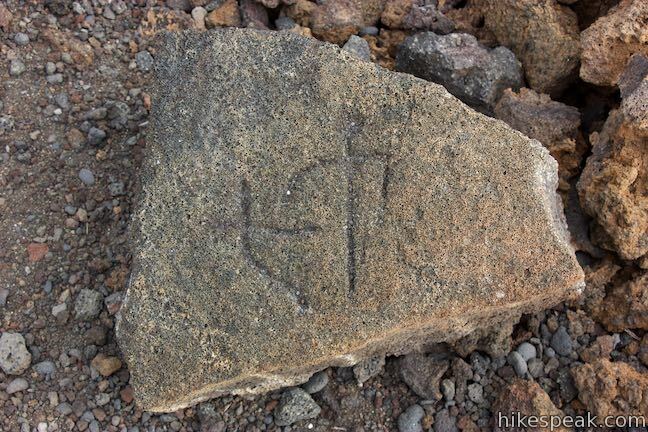 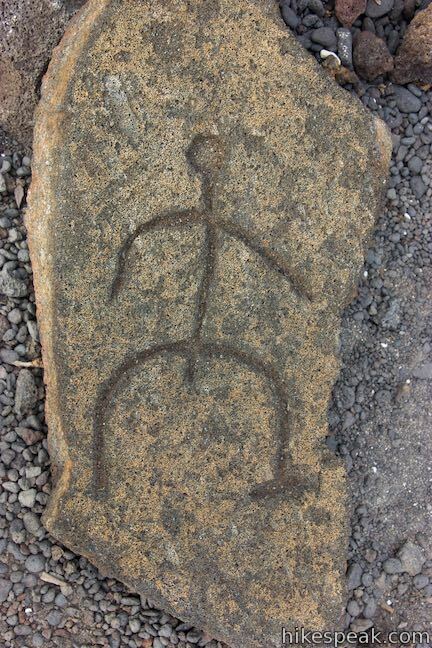 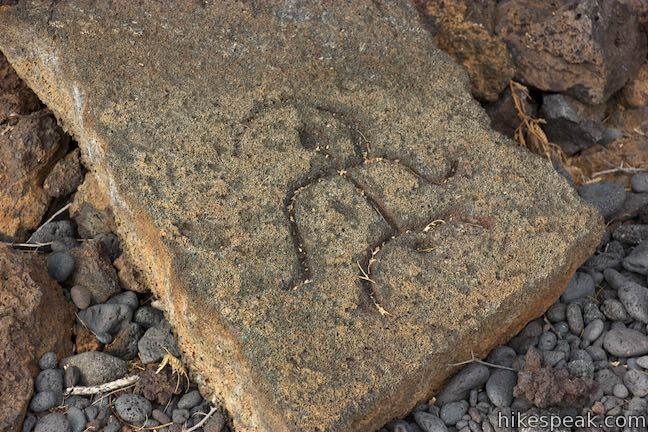 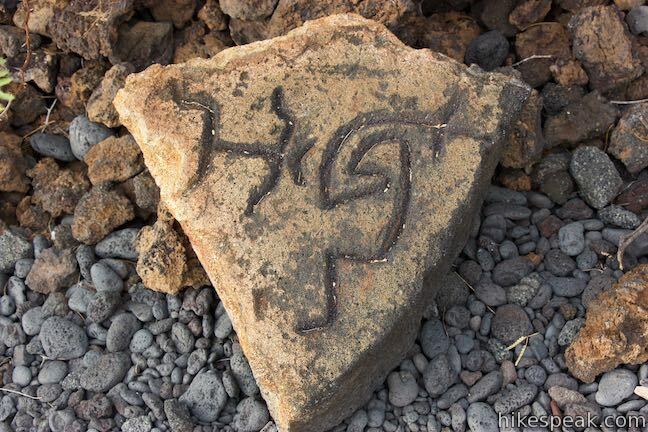 In the Hawaiian language, petroglyphs are called “kii pohaku,” meaning images in stone. 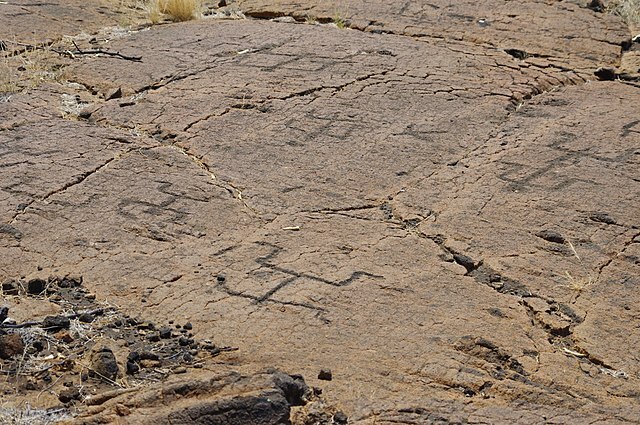 Whether you admire the petroglyphs as works of art or become intrigued by the human history that they embody, you are bound to wonder about the people who carved the petroglyphs and the messages they convey. 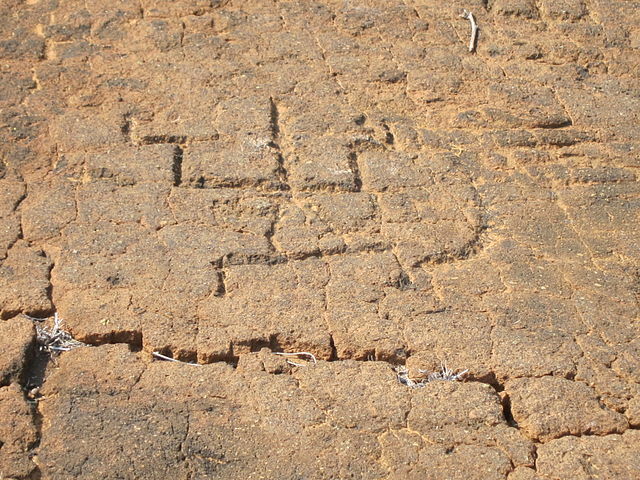 Direct sunlight at midday can make the petroglyphs hard to distinguish. 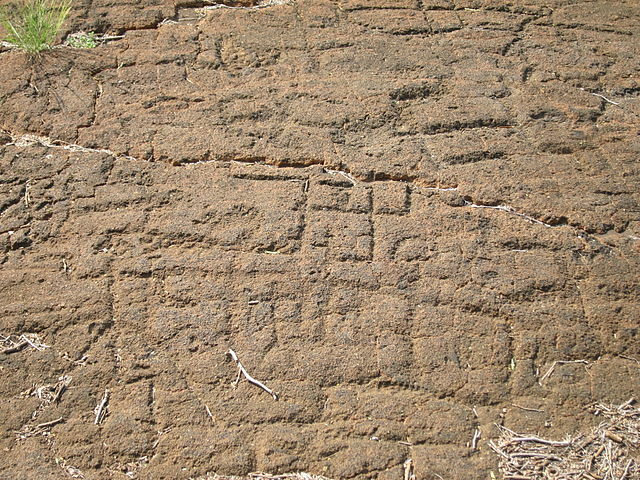 Side lighting in the early morning and late afternoon create better contrast for illuminating the carvings in the rocks. 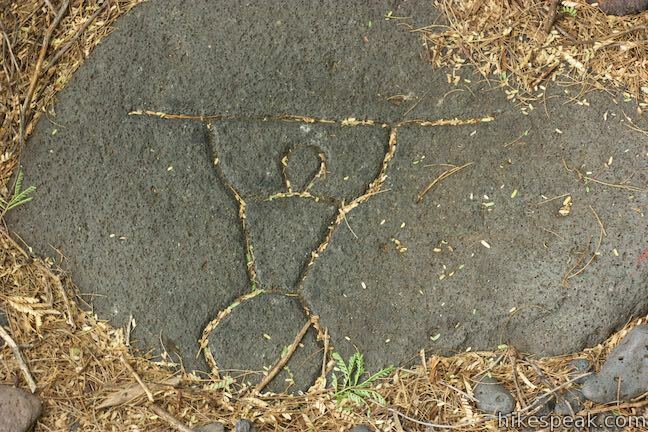 Respect the petroglyphs and obey all fences, boundaries, and preservation rules. 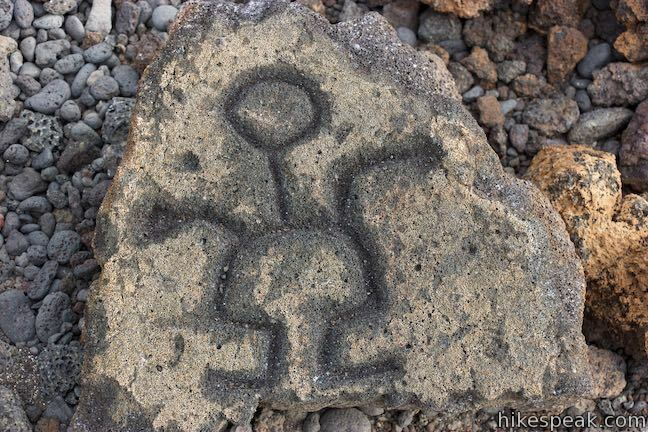 After looking over the petroglyph field, hike back the way you came to complete this 1.2 miles round trip with 30 feet of elevation change. 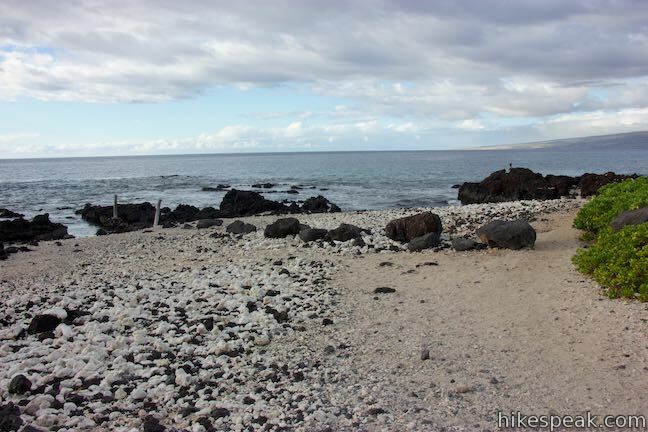 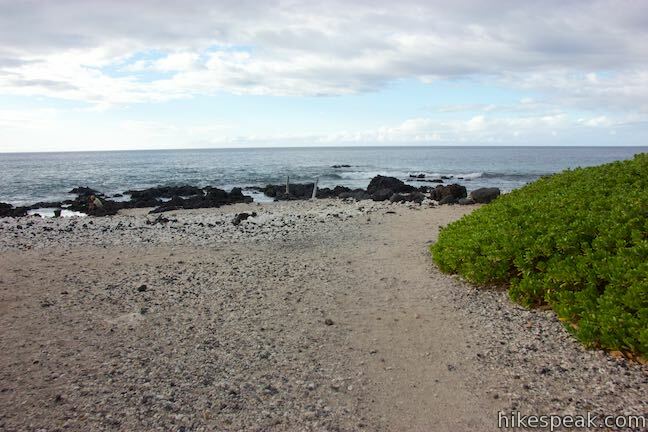 When you get back to the trailhead, walk out the other side of the parking area, passing through a picnic area to Holoholokai Beach (also called Holoholo Kai Beach). 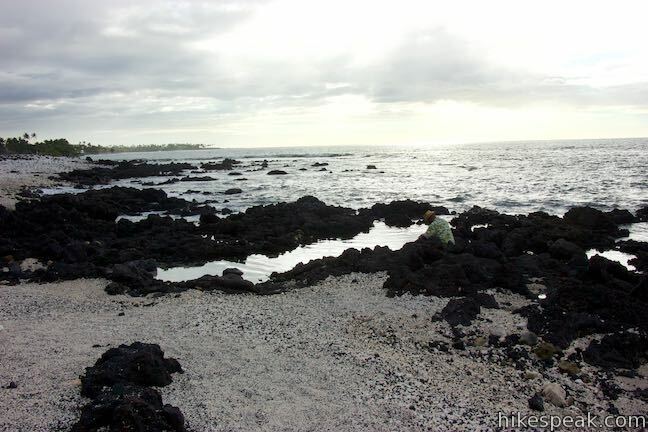 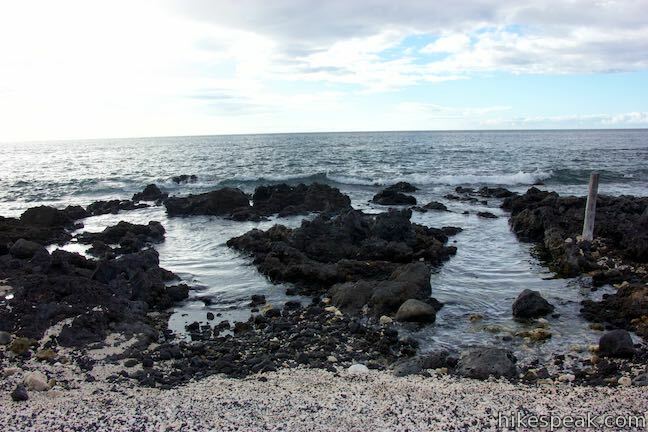 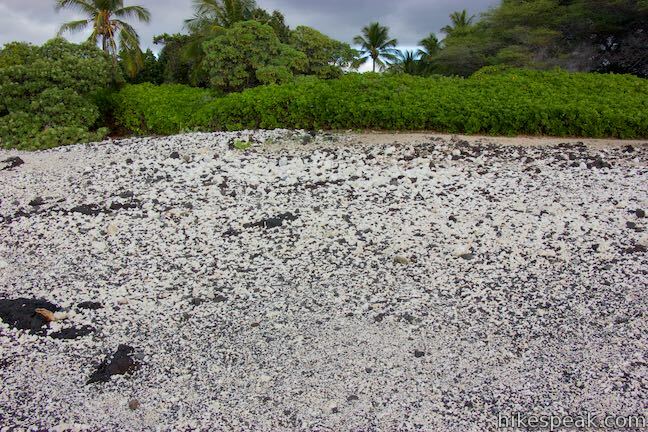 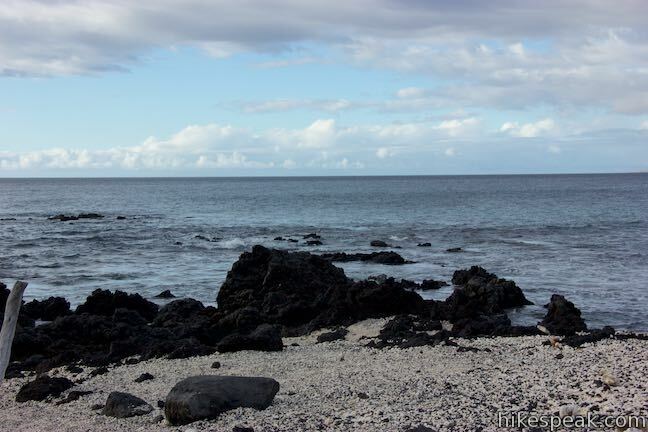 Tide pools line the shore, across a beach surface that looks like a chess board with black lava and white coral mixed together in even proportions. 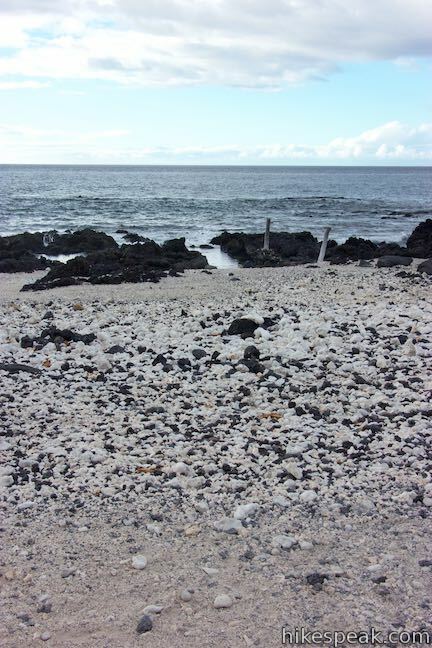 Different areas of the beach have larger and finer pieces, but the mixture remains balanced. 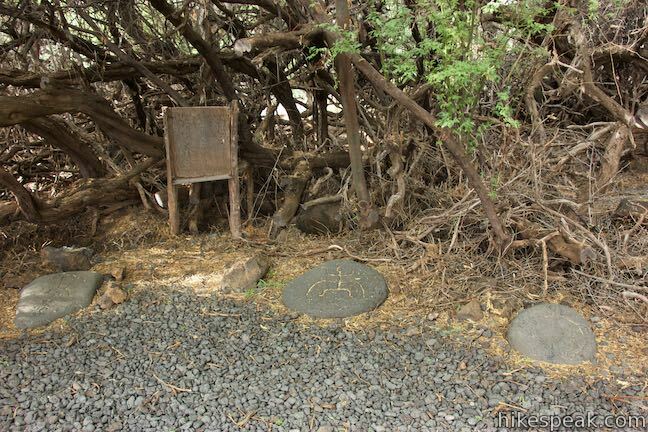 In addition to its picnic area, Holoholokai Beach Park has bathrooms with showers. 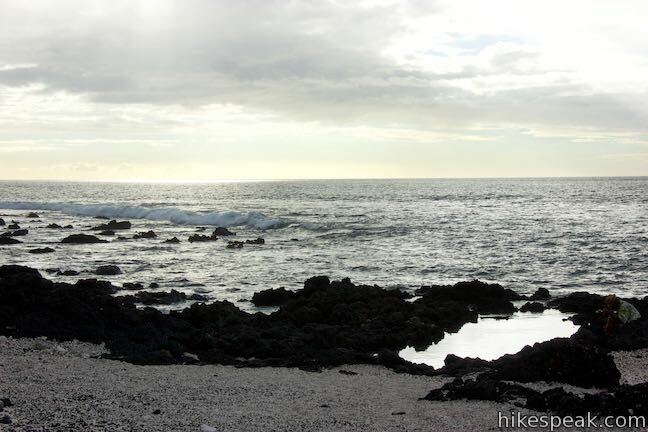 To get to the trailhead: From Kona, drive north on Hawaii 19 for 26 miles. 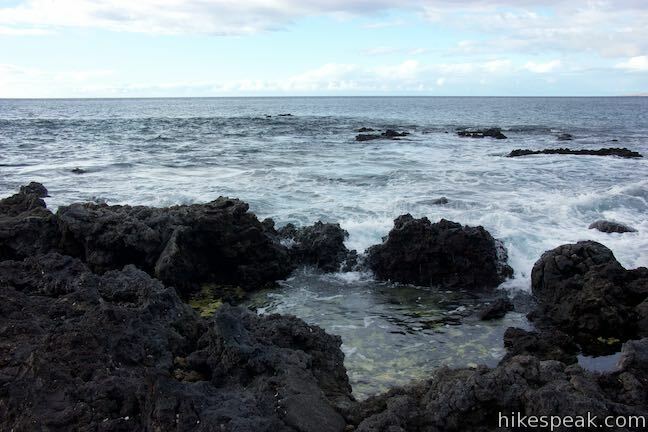 A mile and a half after passing Waikoloa Road, turn left at the traffic light onto Mauna Lani Drive (on the makai side of the road). 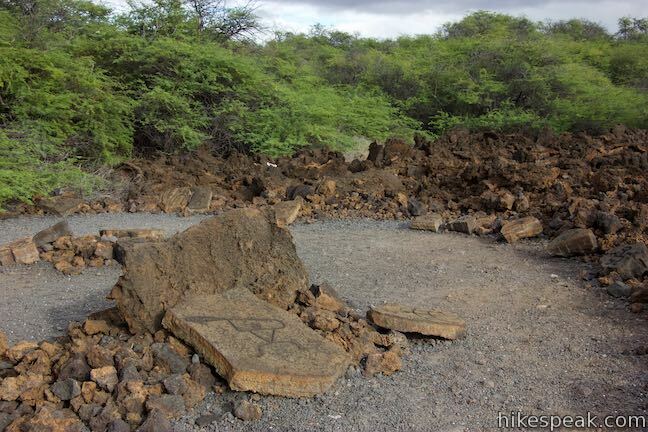 Drive one mile to a traffic circle and take the first exit (like a right turn), following signs for Puako Petroglyph Park. 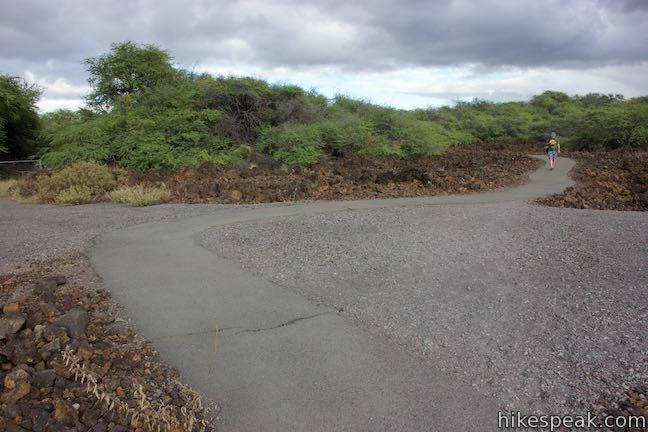 Take North Kaniku Drive for another mile and turn right onto Holoholokai Beach Park Road. 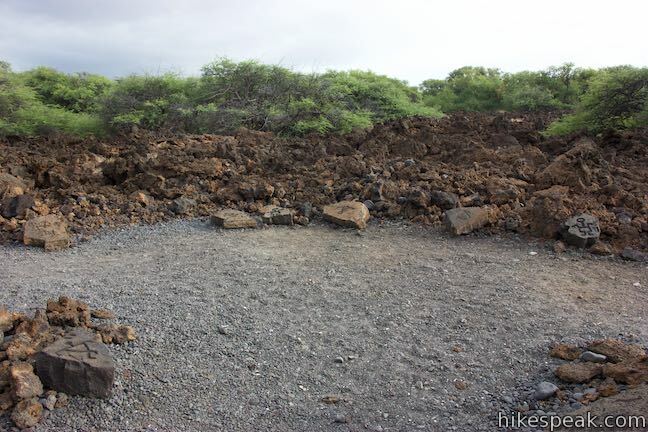 Drive half a mile to the end of the road at the parking area of Malama Trail and Holoholokai Beach Park.